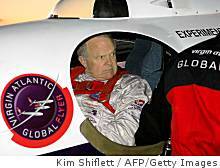 MAMMOTH LAKES, Calif. -- A hiker in a rugged part of eastern California found a pilot's license and other items that appear to belong to Steve Fossett, the adventurer who vanished on a solo flight in a borrowed plane more than a year ago, authorities said Wednesday. The information on the pilot license _ including Fossett's name, address, date of birth and certificate number _ was sent in a photograph to the Federal Aviation Administration, and all matched the agency's records, spokesman Ian Gregor said. Mammoth Lakes police investigator Crystal Schafer confirmed that the department had the items, including the ones bearing Fossett's name. Search teams led by the Madera County Sheriff's Department have been sent to the scene, and an air and ground effort was expected to be under way soon, said sheriff's spokeswoman Erica Stuart. "It was just weird to find that much money in the backcountry, and the IDs," he said. "My immediate thought was it was a hiker or backpacker's stuff, and a bear got to the stuff and took it away to look for food or whatever." Morrow said he returned to the scene with his wife and three friends Tuesday to search further and did not find any airplane wreckage or human remains. They did find a black Nautica pullover fleece, size XL, in the same area, but he said he wasn't sure if the items were related. Mammoth Lakes is at an elevation of more than 7,800 feet on the eastern flank of the Sierra Nevada, where peaks top 13,000 feet. This year's biggest search for Fossett focused on Nevada's Wassuk Range, more than 50 miles north of Mammoth Lakes. That search ended last month.